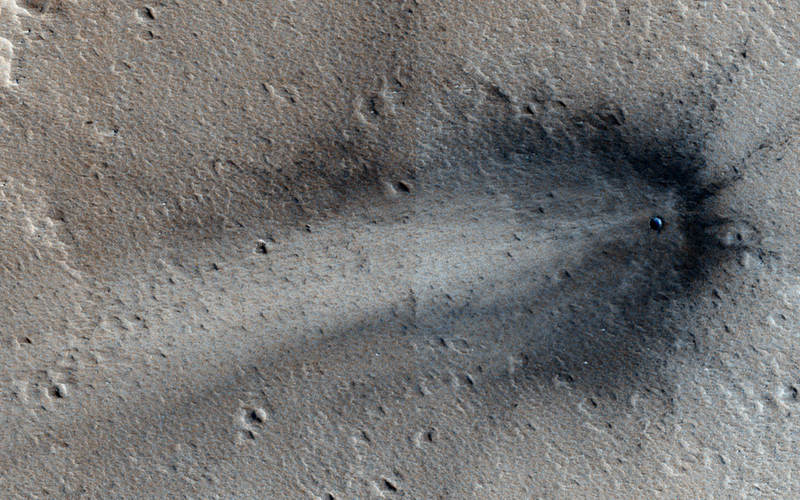 Mars is covered in craters. Most of them are very old. The one you see here is, at most, two years and four months young – certified fresh, in cosmic terms. Scientists keep pretty close tabs on Mars' terrain. The Mars Reconnaissance Orbiter, which has been orbiting the planet since March 2006, is equipped with a suite of instruments designed for exactly this. Among those instruments is the Context Camera, designed for surveying large swaths of the planet's surface. One of CTX's jobs is to monitor Mars' surface for changes over time. That's how we know this crater is new. Two photographs below show the same region photographed first on February 2012, and again on June 2014. Notice anything? All told, researchers have spotted around 400 new craters on the surface of Mars, according to Universe Today's Jason Major. And that's not the only thing scientists are looking for. Monitoring the effects of wind on the planet's geology over time, for example, can help us make sense of Mars' geological and climatological past, present, and future.